My name is Miss Maureen Biassey. I am a single 43 years old woman living in London. I was experiencing severe pain in my abdomen and a bloated tummy. It was as if I was pregnant. Anytime I had my period, the pain was so unbearable I felt like I was going to faint. My sister would use a hot towel and place it on my tummy and she would give me all different kinds of painkillers. I went to the hospital and was diagnosed with ovarian cyst and fibroid. They had been there for the past 15 years. I had two operations in London at St Mary’s Hospital and Guy’s Hospital with the expectation that I was going to be made well but it was all to no avail. I continued to experience really painful menstruations. The pain was so much that every month when my menstruation would come, I would have to lie in bed taking painkillers, using a hot water bottle. It was truly a nightmare. I remember asking God, “When will this be over, Lord help me.” My sister and my auntie then discovered Emmanuel TV. They decided to go to The Synagogue Church Of All Nations where they received the Morning Water and sent it to me. I also started watching Emmanuel TV as well. As I watched and saw all that was happening at The Synagogue Church of all Nations, I was so amazed. I admired what the man of God, Prophet T.B Joshua, was doing in Nigeria, other countries of Africa and all over the world. I started seeing the prophet in my dreams. I became glued to watching Emmanuel TV so much that when I was going to work, I left it on. I was using the Morning Water regularly as well as praying along with the man of God, Prophet T.B. Joshua. One day, I felt a sharp pain in my abdomen as if something was coming out of me, so I quickly ran to the toilet. 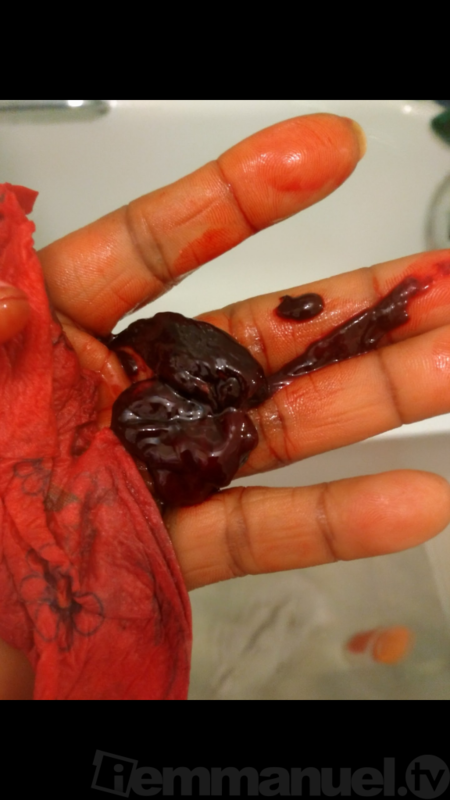 To my amazement, a huge clot of blood came out of me! It was painful at first but after a while the pain went away. Hallelujah! Since then I don’t feel any more pain when I have my menstruation. It is much much much better now and I’m so grateful to God. Thank You, Jesus and thank you dear Prophet T B Joshua! I also had been praying for God to bless me so that I could visit my family in Ghana and come to The SCOAN in Nigeria. Out of nowhere, the council where I live in London sent me a cheque through my post of nearly £1,000. I didn’t know why they sent it to me but I was so excited and I knew it was God’s doing. I now know that everything satan had stolen away from me, God has restored. Attached is the picture of the blood clot that came out. Thank You, Jesus and thank you Prophet TB Joshua. May God continue to bless you and make you slippery in the hands of your enemies, in Jesus’ name! My Spiritual Growth Through Emmanuel TV!! !